The mini roast is a fantastic meal option for 2-3 people that is boneless, easy to carve and ready in under an hour. This beef topside mini roast is covered with a mixture of seasoning, mustard, garlic puree and a little oil for a delicious and easy glaze. A perfect midweek meal. Preheat the oven to Gas mark 5, 190°C, 375°F. In a small bowl mix together the mustard, garlic purée and oil. Place the joint on a chopping board, make several slashes over the surface, season and spread with the mustard mixture. Transfer to a roasting rack in a medium non-stick roasting tin and roast for 40-50 minutes (for medium). Cover with foil if browning too quickly. Remove the joint from the oven, transfer to a warm plate, cover and leave to rest for 5-10 minutes, 20 if time allows. 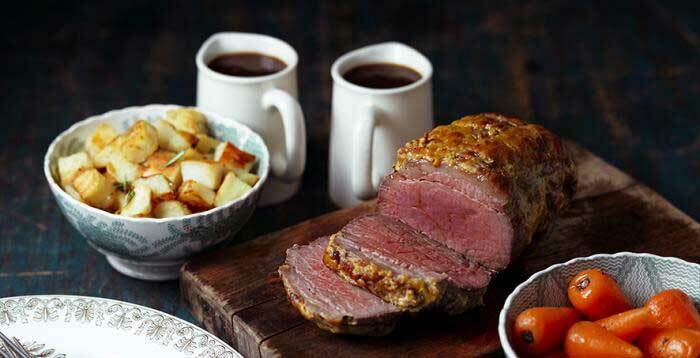 Slice the roast and serve with gravy, mini sauté potatoes and seasonal vegetables. For extra flavour add a crumbled vegetable stock cube in the water when boiling the potatoes or add add 1-2 sprigs of fresh rosemary.